. . .You may be wondering. It’s really just a fancy Latin term for “Big Fungi.” What Macrofungi all have in common is that they form structures called fruiting bodies or sporocarps –these sporocarps are typically the above ground part of the mushroom that you see. When you see a sporocarp, this indicates that the macrofungus is in reproductive mode. When not in reproductive mode, these fungi consist of a nothing more than network of nearly invisible threads, called mycelia, which run through soil or decaying wood. But, when environmental conditions are favorable for reproduction (for example, when temperatures are warm and there is lots of rain), these threads coalesce into the woody or fleshy sporocarp. These can take a wide variety of shapes, but somewhere on or in all sporocarps, tiny reproductive units called spores will be formed. The spores of macrofungi act like seeds in a plant — they are dispersed by the sporocarp, and if the spore lands on a suitable spot, it will produce mycelia, and eventually may form a new sporocarp. Microfungi, by contrast, are mostly invisible for their whole lifetime, except when they produce millions of colorful spores. You may have seen the black spores of bread mold or the blue-green spores of Penicillium in your refrigerator, on occasion! The most familiar group of macrofungi is the mushrooms. 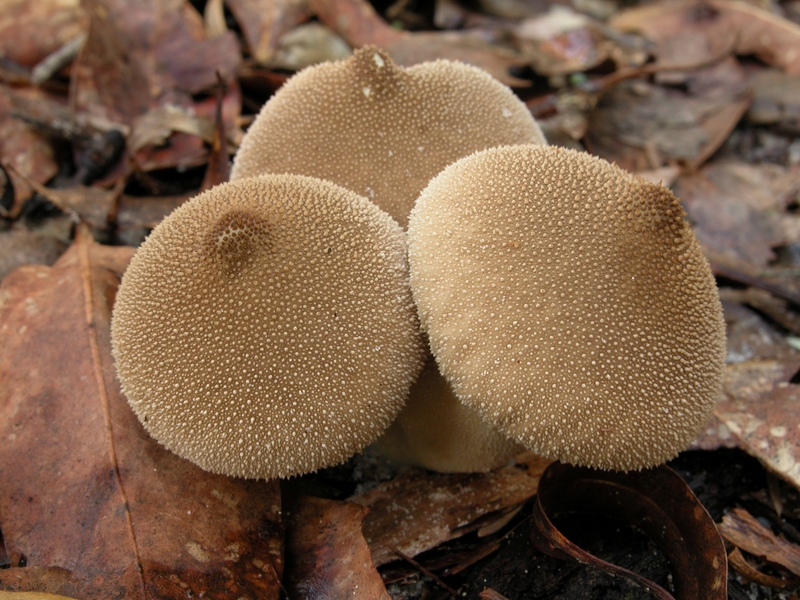 In a typical mushroom, the spores are produced on the surfaces of the gills on the underside of the cap, as shown below. 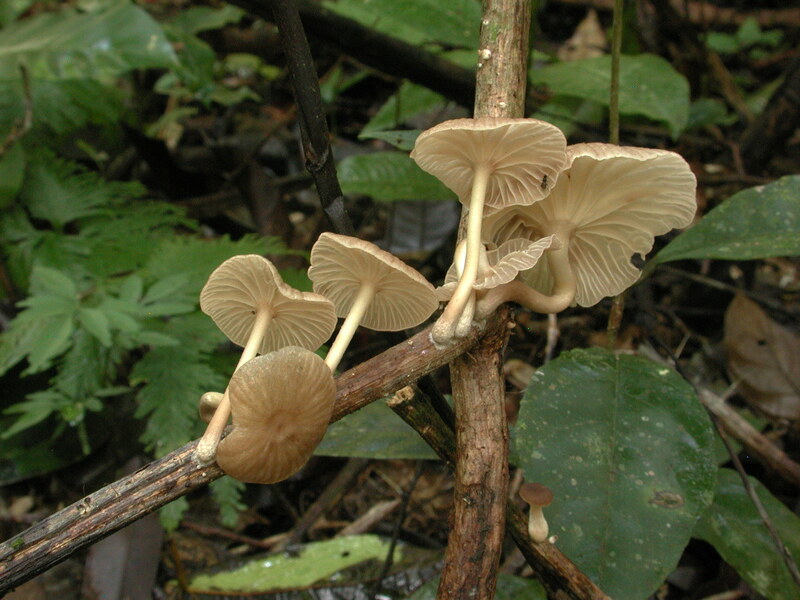 The fungus shown here belongs to the genus Marasmiellus, and was collected in Belize. The boletes look like mushrooms, but have pores instead of gills on the underside of the cap, as shown below. The spores line the inner surface of the pores. 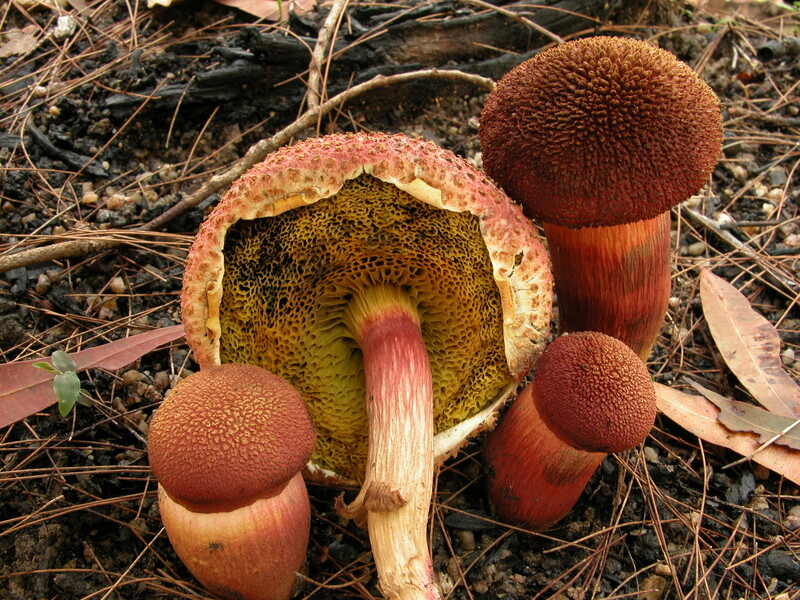 The bolete shown here is the beautiful Boletellus emodensis, from Australia. In puffballs, the spores are produced inside the ball. It’s the spores that make the puff of smoke through an opening at the top of the ball when the puffball is squeezed. The puffball shown below belongs to the genus Lycoperdon, and is common throughout from North America. 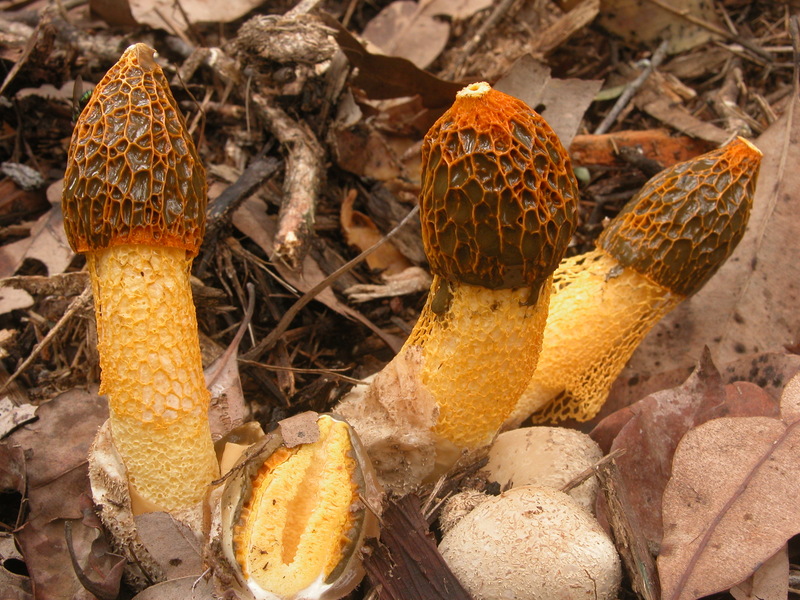 Stinkhorns, as shown below, produce the spores at the top of the stalk. The spores are embedded in a slimy layer that can smell like rotting flesh– flies are attracted by this smell to the stinkhorn, and they carry away the spores on their feet. The fungus shown below is called Phallus multicolor (can you guess why?) from Australia. In the cup fungi, the spores line the inside of the cup. Sometimes the margins of the cup are decorated with hairs or spines. 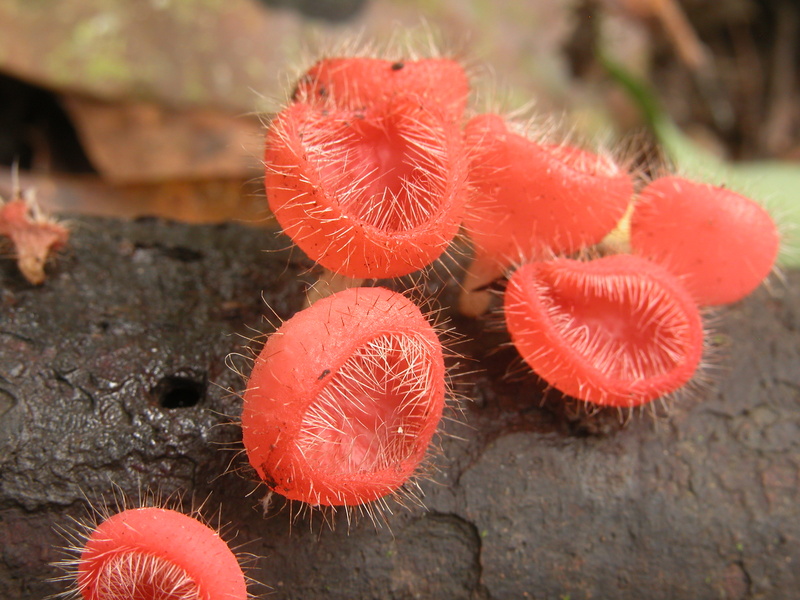 The beautiful little cup fungus shown below is called Cookeina tricholoma, photographed in Australia. Truffles, which grow underground, produce spores inside the sporocarp, as in the puffballs. In the truffles, however, the spores aren’t released into the air. Many truffles produce an odor that attracts mammals, such a squirrels, who dig them up and carry them away to eat later. If the squirrel drops the truffle, or eats only part of it, the spores may be dispersed to a new location. 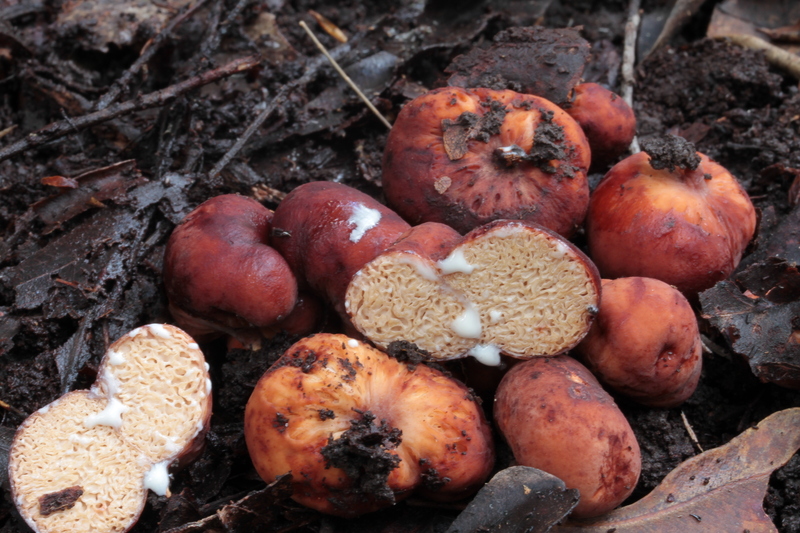 The truffle shown below, Zelleromyces daucinus, was found in Australia. Another feature that unites most Macrofungi is that they play important roles in plant and animal life – some macrofungi are essential for the growth of plants, including some of our most important forest trees. Other macrofungi break down dead trees and return the nutrients stored in the wood to the soil. Some macrofungi are used as food for animals, including humans — we’ll explore some of these roles in future blogs. Photographs used in this blog all courtesy of Roy Halling, Curator of Mycology, The New York Botanical Garden.